Ja Morant is the Truth! Highly touted recruits are a dime a dozen. They all come in as the next superstar. And that very rarely turns out to the case. But Morant is an exception. he jumps out of the gym. He can get a shot against anyone. He's as quick as love at first sight. And he has great court vision. He hit 8-of-11 shots, 2-of-4 from 3-point range. He also had nine rebounds and six assists. Jonathan Stark and Terrell Miller also played well, as each scored 15 points. When Stark, Miller, and Morant are all in the game the Racers are very hard to defend. Shaq Buchanan played well too, as he scored 19 points on 9-of-11 shooting. Byron Hawkins and Anthony Smith did not play well. Hawkins made just 2-of-6 shots, 0-for-3 from 3-point range and he committed four turnovers. Smith made just 1-of-6 shots from the field and 3-of-8 from the free throw line. And he failed to seal and meet the ball on two passes that were thrown to them resulting in two turnovers. Brion Sanchious had one of the best games of his career. He hit an open 15 foot jump shot and grabbed eight rebounds. He still needs to work on his free throw shooting as he made just 1-of-4 free throws. Murray State did not play well on defense. 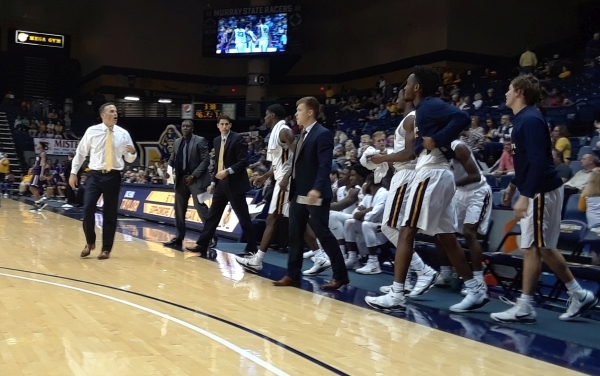 The Racers gave up several unchallenged 3-pointers and occasionally failed to stop the ball in transition, or lost a man and let him get through for an unchallenged layup. The result - a McKendree team that shot just 33 percent from 3-point range last year while averaging 79 points made 46.7 percent of their 3s and scored 82 points. Murray State was favored by 24 points according to the Massey Ratings. They won by 16. Last year, McKendree finished with a 9-17 record. They were 3-15 in the Great Lakes Valley Conference and are picked last in the Central Division of the GLVC this year.